How I love that pattern...just like the Shelley Dainty Blur. Thanks as always for your great posts! Terri, your teacup looks so cheerful!! The pretty blue just pops off the crisp white so beautifully! What a treat that will be for a special cup of tea. Hi Terri! First of all I hope that you are resting and that you will be feeling fine soon. Now about that sweet tea cup. That's just the perfect name for it ~ Dainty Blue! The teacup is lovely Terri! It does have a Shelley look to it, which I adore. I hope you have a wonderful week! yes, this is indeed "Dainty Blue". Such a happy blue like the heaven in midsummer. And it don't amazes me that it is made from Royal Albert. They have so many really nice shapes. Thank you for sharing your treasure and for hosting this nice event. Oh I do love this tea cup . 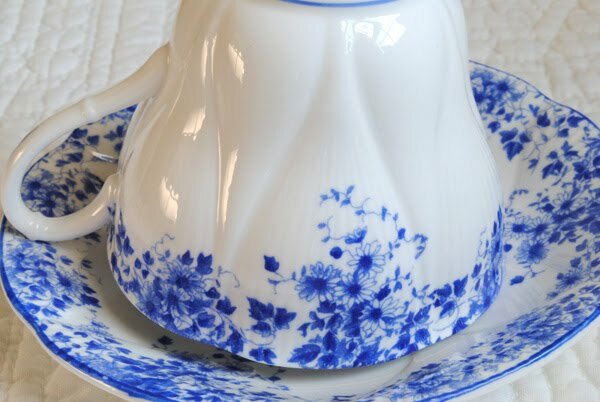 I have a love for blue and white china, really, almost all things blue. The name of this teacup is perfect! I too hope you are well, and resting to keep well. Love the blue and white combination - I never tire of it. 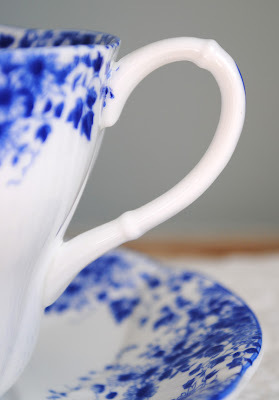 How beautiful, blue and white crockery really steals my heart every time! Terri, your cup/saucer are dainty lovely indeed. Such a pretty spray of flowers to welcome you to enjoy a quaint cup of tea. The deep blue reminded me of Cornflowers (? )Are they blue - I think so. The shape is very nice - almost like an opened accordion effect. Simply lovely. I'd like to invite you to view the teacup card tutorial for your Teacup Tuesday celebration. I love that blue pattern on white! Watching your tea cups is always a great pleasure! Your cup is beautiful! I also don't usually buy blue, but I do like that one! I joined in the party!! Gorgeous Terri..I love anything in the blues...very pretty..and yay spring is on the way! Enjoy your beautiful daffs!! Have a sparkling day full of magic! What a pretty teacup--love the blue! What a beautiful little treasure. So very different and sweet. 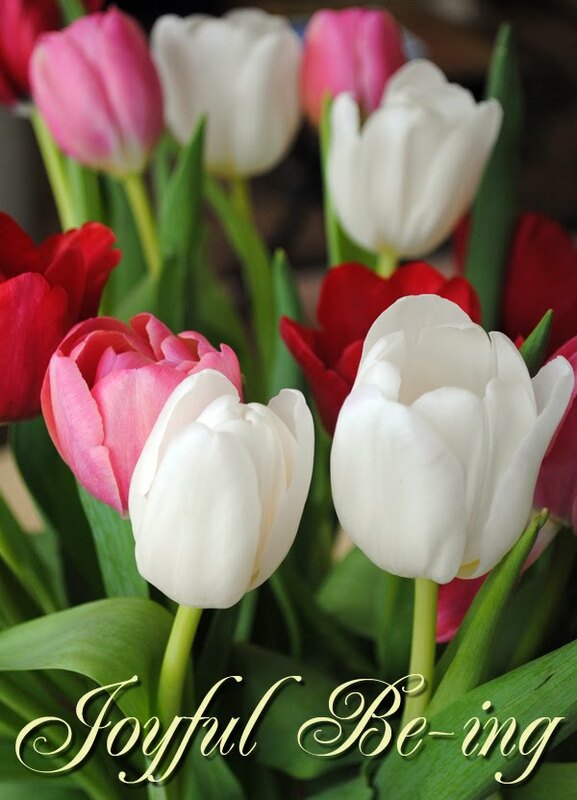 I hope the tulipes and the nearly spring are making you feel better! i love the baeutiful teacup! I don't often see ones like this...that blue is stunning! thanks for sharing...and btw..I buy my flowers from Walmart and Grocery stores....they're less expensive and last long for me! There's just something so charming about keeping fresh flower arrangements in your home on a regular basis....so when I'm out getting groceries..I grab a bunch that speaks to me! I'll have my tea cup posted in just a minute! it is similar to debi's cup! That blue cup is so VERY lovely. The shape AND the flowers, not to mention the color. Definitely a sweet addition to a collection! Very pretty! I don't usually buy blue either but this is very beautiful! What a pretty cup Terri. I know what you mean about blue and white china - but some patterns are irresistable aren't they? The flowers ar ebeautiful too. Hope this week is a better week for you. I thought it was Shelley! Beautiful pattern. 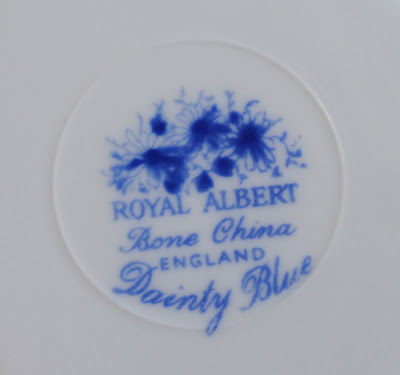 I have never seen anything like that from Royal Albert. Terri I just love all your collections...I'm always forgetting about Teacup Tuesday. Hope I;m not to late...thanks for sharing your treasures! Thank you so much for your kind comment about my Alice in Wonderland post - I bet your bracelet will look beautiful when you have finished it! Terri, this is absolutely beautiful! What is it about blue that we all love so much! And it's a color we dearly miss when it isn't above us outside! What a difference it makes in our frame of mind. I am very late visiting your party this week; sorry! I have been sick with the flu but am finally up and about. Your teacup is really sweet! I love the shape of it! Thanks for stopping by and having tea with me earlier. Wishing you a lovely weekend. I love your blog and your beautiful teacups! Thank for sharing your treasures with us and hosting tea! Simply beautiful! your beautiful blue and white teacup reminds me of the shape of the pretty red tulips you have pictured. The color is so fresh and pretty and "dainty" as it's name. love the blue! such a sweet and delicate cup! there is something about blue and white that is sooo lovely! Happy Sunday to you! 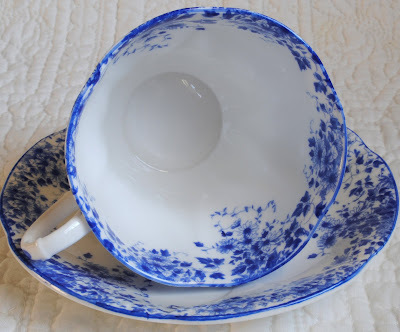 That is a lovely blue and white teacup - I love that shape too. It's facinating to see the diversity of Royal Albert patterns. Thank you Terri for visiting my blog! I love your Tuesday Blue and your collection is awesome! I'm going to try and and remember to join this every Tuesday, I have so much to share with all you wonderful collectors! ~ thanks again for sharing your lovely teacups! This teacup is absolutely GORGEOUS! Congrats for the purchase! 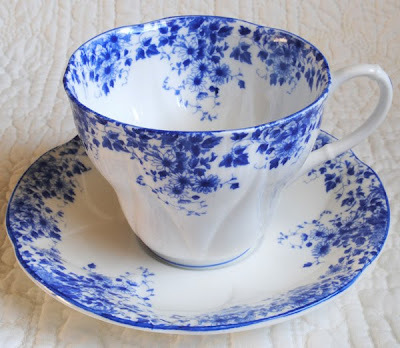 I just LOVED this "teacup tuesday" thing! I love china, so I loved to see all the links to see what people were posting. Hope you guys enjoy my teacup as well!